At present, there are various sources, one known and others suspected, of high-energy neutrinos (and anti-neutrinos) coming from the sky, as illustrated in Figure 1, taken from the IceCube talk that announced the result. When cosmic rays (mostly high-energy protons and some atomic nuclei created in natural particle accelerators in outer space) hit atoms in the atmosphere, they produce showers of hadrons, some of which are pions and kaons. Some of these in turn decay to muons (and anti-muons) and neutrinos (and anti-neutrinos). These “atmospheric neutrinos” take a wide range of energies, and (just like the cosmic rays that make them) become increasingly rare the higher-energy you go, the number falling like 1/(energy)3.7. 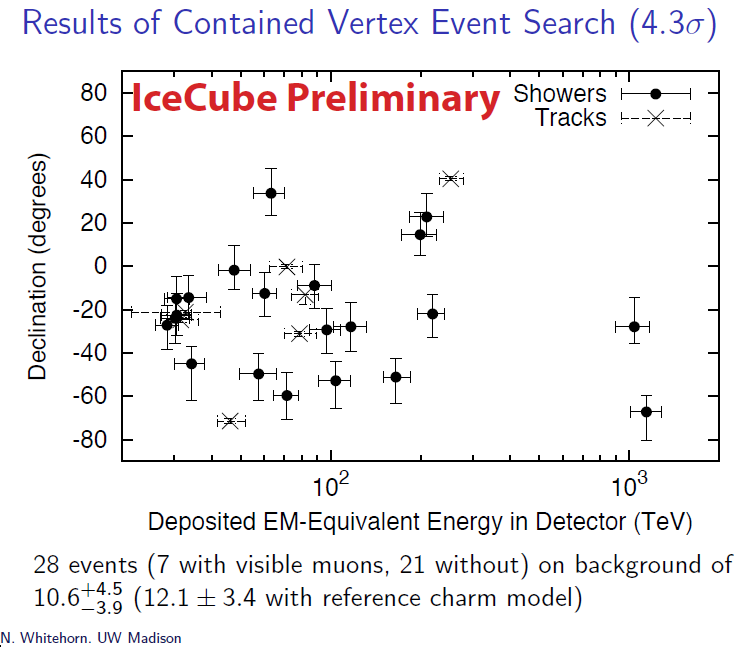 They should be detectable by IceCube out to energies of a million GeV or so (the black curve in Figure 1), and in the early days of IceCube were already detected out to about 300,000 GeV (the blue dots in Figure 1). The cosmic rays give a second source of neutrinos that may be observable around a hundred thousand to a million GeV, from the production of charm quarks, which can create a small number of neutrinos that fall off more slowly with energy than do the neutrinos from other hadrons. One prediction for how many “prompt atmospheric” or “charm atmospheric” neutrinos should be present is the red curve in Figure 1. Fig. 1: The number of neutrinos (and anti-neutrinos), multiplied by their energy-squared (to make the plot easier to read but harder to interpret), per unit angular area on the sky, versus the energy of those neutrinos. Older data from IceCube is the blue dots. Predictions for four different sources of neutrinos (see text) are given by the four curves. 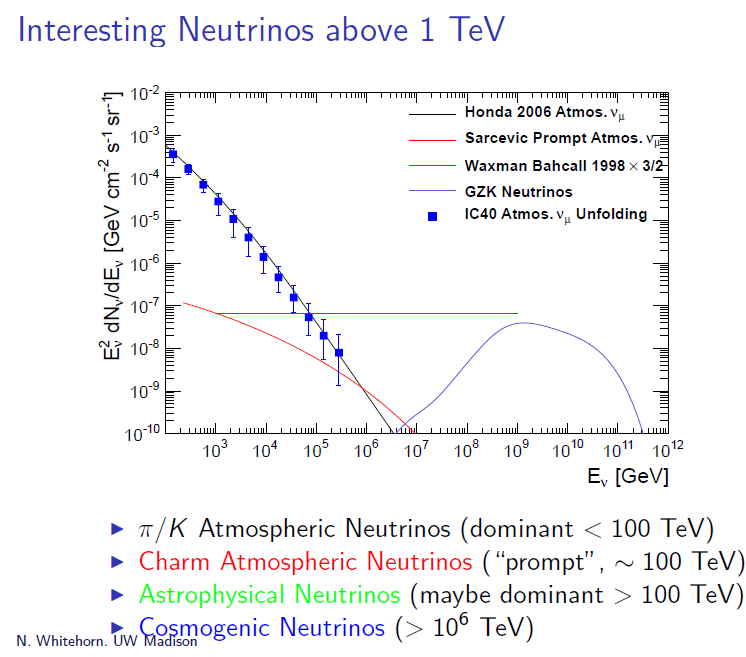 Note the green line for astrophysical neutrinos could in fact be lower than shown. 1 TeV = 1000 GeV. Plot taken from the IceCube talk. Neutrinos produced when the very highest-energy cosmic rays collide with photons from the cosmic microwave background (mainly through the process proton + photon –> “Delta” [an excited version of the proton] –> neutrino + pion, followed by pion –> anti-muon + neutrino, and also by anti-muon –> anti-electron + neutrino + anti-neutrino). These are called “GZK neutrinos” or “cosmogenic neutrinos”. Since the number and energy of high-energy cosmic rays is roughly measured, the number and energy of these GZK neutrinos can be roughly predicted. High-energy “astrophysical neutrinos” produced directly inside extremely energetic astrophysical objects, perhaps including the objects that make gamma-ray bursts. Since little is known about what objects are out there and how they work, the only clear thing that can be said about these neutrinos is that there can’t be too many of them (or we’d see more high-energy cosmic rays than we do). It is expected that the number of neutrinos from such sources will decrease as 1/(energy)2; since the plot in Figure 1 shows not the number of neutrinos but the number of neutrinos times their energy-squared, the (very rough) prediction from astrophysical sources is a flat green line in Figure 1. We don’t know how many of these neutrinos to expect, so the location of that line, though it cannot be higher than shown, but could well be lower. Recently, in their data from 2010-2012, IceCube reported, in a pre-publication paper that appeared a few weeks ago, that they observed two neutrinos with energies of about one million GeV. [For some reason I don’t know, they amusingly decided to call these neutrinos Bert and Ernie.] These are unusually energetic for atmospheric neutrinos, yet not energetic enough to be GZK neutrinos. This makes it likely (but not certain) that they are from new astronomical sources! But with just two events, it’s hard to say anything else about them. Until yesterday. Yesterday, IceCube reported that, by using a technique that reduces the number of atmospheric neutrinos in their data, they were able to look for neutrinos from other sources at somewhat lower energies. They expected something like 10 (more precisely 10.6+4.5-3.9, or, including the charm atmospheric neutrinos in some model [??] 12.1±3.4 ) — about 5 from atmospheric neutrinos and 6 from muons from cosmic rays that give fake signals of neutrinos. But, as shown in Figure 2, they observed 28, including the two I mentioned in the previous paragraph. (To be clear, this means that 10 to 20 of them are probably neither atmospheric neutrinos nor fakes.) This is strong evidence (4.3 standard deviations) that IceCube is observing neutrinos that are not from atmospheric neutrinos… but they aren’t GZK neutrinos either. Fig. 2: The 28 observed neutrino candidates, as a function of their energy in TeV (1 TeV = 1000 GeV) and their angle relative to the horizon. Some of these are probably atmospheric neutrinos and processes that give fake neutrinos, but many are apparently real neutrinos from a new source. Note the two highest energy neutrinos (“Bert” and “Ernie”) are out at 1000 TeV = 1 million GeV, while the next highest-energy neutrino is at 300 TeV; I suspect the gap is probably just a statistical fluke that will go away when more data is collected. They have some features expected from astrophysical neutrinos… they are consistent with coming uniformly across the sky (though with so few neutrinos it’s hard to tell), and their numbers appear to decrease with energy more slowly than atmospheric neutrinos do across the range of 20,000 – 1,200,000 GeV. There’s no sign that these neutrinos are associated with other particles simultaneously coming out of the sky, as would be expected for overhead cosmic rays that make atmospheric neutrinos. And, unlike the atmospheric neutrinos which are more often muon-neutrinos and muon-antineutrinos, these neutrinos seem to be more evenly distributed among the three types of neutrinos and antineutrinos. But on the other hand, there are some possible challenges for this interpretation. If their numbers really decrease with as 1/(energy)2, as naively expected for most astrophysical sources, then IceCube should also have seen some additional neutrinos (something like five to ten of them) well above 1,000,000 GeV. Moreover, these neutrinos (which should have traveled straight across space from their source) don’t point back toward any known object (such as an active galaxy or a recent gamma-ray burst) so we don’t have any way to know what type of object may be producing them. In short, these neutrinos appear to be from a new, unidentified, and perhaps unexpected type of source! We must remain somewhat cautious about any new result that comes from a single experiment and involves so few neutrinos. But if IceCube’s result continues to hold up with more data and is confirmed by other similar neutrino experiments, or if in future this class of neutrinos can be linked with specific astrophysical objects, I suspect it will be seen as a major discovery — one that opens up the era of neutrino astronomy, and whose implications can today only be guessed at. This entry was posted in Astronomy, Particle Physics and tagged astronomy, neutrinos. Bookmark the permalink. How about cosmic rays from the event? Might we also expect the highest energy cosmic rays ever measured? Perhaps even a black hole in the upper atmosphere? Whatever generated these neutrinos probably generated high-energy protons which will eventually be high-energy cosmic rays, and may also have generated high-energy photons. But if these things were produced far from our galaxy, the protons are not expected to be observed at the same time as the neutrinos, because the protons travel on curved paths in the magnetic fields of outer space. Photons might have been seen, but it turns out they haven’t been. This is part of why we don’t know what is making these neutrinos. See https://profmattstrassler.com/2013/05/09/neutrinos-from-that-recent-gamma-ray-burst/ . As far as I can tell, black holes in some exotic gravity theory could not generate these events without contradicting a lot of other data. I was thinking of micro black holes in OUR upper atmosphere resulting from cosmic rays produced by the event. But since we don’t know anything about these events, what is there to say? Maybe. Maybe not. And you still have to assume an exotic version of gravity, for which we have no evidence at present. I also recall that black holes that generate neutrinos make signals that are strongest near the horizon, which is not true of these. Very interesting, and well written article. How do they know what angle the neutrinos are coming in from? As most neutrinos will pass through the detector (or the earth for that matter) without being detected. Could these neutrinos be coming directly from supernovae or interactions within stars (including our own star)? The neutrinos that pass through the detector are indeed not detected. But one that hits something within the detector makes lower (but still high) energy particles that then make Cerenkov light, which is what they actually detect. The Cerenkov light pattern tells them where the lower-energy particles were going, and that in turn tells them where the neutrino was coming from. Are Bert and Ernie from the same astronomical event, or were they just reported at the same time from two different unknown origins? Bert and Ernie occurred at separate times and locations; that is true of all 28 observed events, as far as I am aware. I assume that if any two of them had occurred at the same time (very unlikely indeed, because of how few neutrinos interact with anything in IceCube) that would certainly have been mentioned! Two coming from the same location in the sky is less unlikely, but they seemed to say there was no evidence of that. Man, even when I only understand the bare surface of what I’m reading (call me a fascinated layman) I always walk away from this blog feeling like I’ve learned something amazing. It is confirmed in the next months,this is the best news we could have in particle physics and astrophysics, taking into account that the neutrino has been the most surprising particle in Physics, we can expect many surprises (more if we have some sterile neutrinos, majorana neutrinos, …). The neutrino window (and its high energy astronomy) opens with these observations! We must learn as much as we can from the data, and if it we understand this, maybe we will learn something else about the scale of new Physics. And we are lacking yet the cosmological neutrinos…Neutrino astronomy is opened but neutrino cosmology is yet to come! We need them both, and I am pretty confident about this. 1. They really come from numerous sources uniformly distributed in the sky. 2. They come from a small number of point sources but are scrambled in directional source by interactions en route to the detector (e.g. perhaps a decay chain of an incoming particle commences when it interacts with the sun’s magnetic field or the atmosphere or intergalactic magnetic fields) and the detected high energy neutrinos that are an end product appear to have no clear directional sorce because of the directional randomness of particles produced in earlier stages in the decay chain. I guess that the question is why we cannot resolve direction in these 2 particular events. The answer is that the interaction we observe is a Neutral Current (or electron neutrino–same signature) interaction. This means that you have in your detector an extraordinarily big sphere of energy (about a million photoelectrons measured in a 6-building block sized area). The timing profile –> and thus the direction cannot be resolved sufficiently in IceCube / especially compared to the muon channel which has a very long track to reconstruct. This is the experimental detection part of the story. When you do the analysis there are two ways to act (conceptually). b) Search for diffuse neutrino flux. in a) you apply a cone centered in your telescope around the potential source. It’s size is comparable to your angular resolution. You try to observe any excess within this cone. This approach drastically reduces atmospheric neutrino background. in b) you just search for an excess of neutrinos vs energy. If their energy is higher than some threshold you impose (namely a threshold which is above the median of the atmospheric neutrino spectrum), then you have potential candidates and search for good statistics. Since IceCube cannot resolve with good accuracy the neutrino cascades they observed , they cannot point back to any source. However if they cluster their observations back to some point in the sky, they don’t observe any hot spot. Therefore they say that IF the events don’t come from background they should be diffuse neutrinos. Where do diffuse neutrinos come from? Anywhere. They might be , as you very correctly stated, due to various point sources emitting neutrinos, might be due to cosmogenic neutrinos, might be due to dark matter annihilation(!) , but one way or another, we cannot know if we don’t have good statistics to see the shape of the spectrum. So far they seem to be astrophysical because they seem to have a E^-2 dependence. We don’t know anything about the point sources in the sky. They might be uniform, they might be not. I personally tend to the uniform scenario — if you believe that every AGN is a candidate source of neutrinos, and every AGN has a black hole within, then it’s straightforward to say that the distribution of black holes in the sky is roughly analogous to the distribution of point sources. There might also be “hidden” point sources, meaning, sources that do not emit gammas (due to the density of matter and radiation around them) but might emit neutrinos. In general, the rule of the thumb is to look for high energy gamma sources , model them to see if the gammas are coming from leptonic interactions (inverse compton) or hadronic (pion decay). The two sources used from Km3NeT (european Mediterannean wannabe km3 neutrino telescope) are Vela-X and a Supernova remnant in the galactic centre named RXJ 1713. They have been modeled to have an admixture of hadronic and leptonic component. Note that these neutrinos are energetic enough to be absorbed by the Earth – they don’t see any coming up from below, only from above. What I wonder is what could cause a 1.2 PeV cutoff – that sounds like it might be telling us something fundamental about the source physics, rather than about interactions in route. Actually, IceCube sees neutrinos from all directions, including those that have had to pass through the earth. While we talk about events in the atmosphere, when it comes to neutrinos it doesn’t matter if there’s a few thousand miles of rock between that atmosphere and the detector. Is it possible the same effect in the hypothetical astrophysical source would cause a cutoff? What would that tell us about the source? Not sure what you mean by “same effect”, but I’m not enough of an expert in the various astrophysical sources to tell you what is and isn’t possible. And I’m not sure even the experts know enough yet. What do you mean with the word cutoff? potential galactic neutrino sources suffer a cutoff , whereas the extragalactic sources have a much flatter spectrum..
With two events at the high energy end you certainly cannot tell whether it is a sharp or slow cutoff, or that the cutoff is really at 1.2 PeV. Remember, with one event you can’t tell the difference between a flat distribution and a narrow peak; you have to collect a lot more data. Similarly you can’t determine the shape (or even presence) of a cutoff with just one or two events isolated near the end of the distribution. It might just be that the spectrum is steeper than 1/E^2, or even that statistical flukes are making a shape that’s really not there. And the cutoff, if there is one, might be at 4 PeV. Since we don’t have any details yet, it’s too early to say much about what the cause of “it” might be. They might be coming from a little below the horizon. Two neutrinos. And this detector is usually very quiet, you imply. Are there any known sources of artifacts? No, the detector is not so quiet. It just doesn’t often see neutrinos with 1 million GeV! But it seems many with 100-1000 GeV. See the data in Figure 1. And it sees tons of muons from cosmic rays all the time. It might also be prompt atmospheric neutrinos that interact. However, so far we have detected about 30 events with >10TeV energy, which gives a 4.3 sigma effect. The Bert & Ernie effects however , are highly unlikely to be artifacts.. This is because, each cascade , according to Halzen, has a size of 6 building blocks!! and they have a vast nr of photoelectrons detected. Page 34 of this presentation : https://events.icecube.wisc.edu/getFile.py/access?contribId=76&sessionId=41&resId=0&materialId=slides&confId=46 shows where the observed neutrinos were coming from. There seems to be a cluster of points about 13 deg from the galactic center, but there is no obvious source there (of course, if you go deep enough, there are quasars just about everywhere), nor do these locations seem well-correlated with the Fermi gamma ray sky map. That’s the talk I linked to; but it doesn’t explain enough. This talk nominally provides more information about where in the sky these neutrinos are coming from, and concludes that the there is “No evidence of spatial clustering,” but it doesn’t try and correlate the observed directions with any possible sources. Meh – I don’t find this useful either. There’s not enough introductory detail for me to follow what some of the jargon means. Is it for a small. infinitesimal but not zero, volume of space to exist without -energy? If no, is this the boundary of spacetime? Could it also be the key to quantum confinement? Any state (a unit difference in energy densities between two “points”) will have a vector towards the lower density but can never achieve zero, so it changes it’s direction. Hence creating the unit spinor. Please, let’s stick to comments related to the topic of this article. Thanks Matt, thanks Marshall, this is good stuff. What energies would the cosmic neutrino background from the BB be at? Colder than the microwave background photons; energies of order 1/5,000 electron volts, i.e. less than a trillionth of a GeV. @Matt – that was exactly my reaction to the Neilson presentation. If all the neutrinos come from some weak interaction processes, why is energy dependence in Fig. 1 so much different for different models? Is it easy to see that? Thanks. They all come from very different processes. The atmospheric neutrinos come from moderate-energy cosmic rays hitting something in the Earth’s atmosphere. The GZK neutrinos come from extremely high-energy cosmic rays hitting cosmic microwave photons out in space. And the proposed Astrophysical neutrinos are supposed to come directly from big explosions with large magnetic fields that generate the extremely high-energy cosmic rays and neutrinos at the same time. Thanks for the reply.I was expressing my great surprise at dN/dE(nu) (taking out E^2 ) changing by factors of 10^10 to 10^32) for various processes. For the same particle production, I had never seen this before. But it must be true. 1.) It’s the first and only experiment of it’s kind. There are lot’s of neutrino astronomy “proof of concept” experiments, but they aren’t big/sensitive enough to really expect results. Largest of these is ANTARES, which is ~5% of the volume of IceCube and it’s energy range is much more narrow (10 GeV – 100 TeV). In the future we’ll have KM3NeT, but that’s years down the road. 3.) Lastly, when we say “expected astrophysical neutrino distribution”, we don’t know what we’re talking about (unlike the expected atmosphereic neutrino and cosmogenic neutrino distribution, which we know roughly what to expect). We guess the flux goes like E^-3 since that is what we observe in the ultra high energy cosmic ray (UHECR) flux. While that is a logical assumption, since the sources of UHECRs above ~PeV are a mystery, we can’t realistically expect the neutrino and hadron distribution to behave in the same way. There are models that predict neutrinos being accelerated along with UHECR hadrons and models that don’t. Most researchers agree that these models are far from robust, and we really have no clue how to accelerate particles up to GZK energies with known astrophysical bodies (so people talk about monopoles & Lorentz violation & other weird stuff). All of this mystery is magnified by the fact that we don’t see GRB neutrinos, when the accepted models predict that we should. The collaboration is confident these ARE astrophysical neutrinos, but they are a bit puzzled as to what KIND of astrophysical neutrinos they are. I’m excited to see where this goes once there is more data. To me, this is almost as exciting as cosmogenic neutrinos would be! Does anybody know whether neutrinos have ever been seen to be moving at anything less than ~c? You can accelerate a photon in the vector sense by changing its direction via Compton scattering. But (in free space) you can’t make it go slower than c. In this sense the photon is not like the electron. But what’s the neutrino like? If anybody can answer this I’d be grateful. No, to my knowledge all measurements of neutrino speed have shown they move at approximately c.
The problem is that in the normally encountered range of energies and assuming the largest likely mass, neutrinos should move >0.999c As such the difference falls below the uncertainty in the measurements. This is why OPERA made claims of seeing neutrinos move *faster* than light, a simple unplugged cable was enough to distort the measurements. At present we do not have an experiment accurate enough to tell the difference. Directly measuring that neutrinos move at speeds below c hasn’t been achieved yet. The problem is that with neutrinos masses being so small, you need a huge number of low-energy neutrinos produced with very precise timing. Astrophysics doesn’t provide this, and we can’t do it on the ground. I just want to point out Delta decay doesn’t produce a neutrino. It should be Delta->neutron+pion. I am sure it’s just a typo. There is a new (very short) paper in Arxiv that claims these neutrinos must be from AGN : http://arxiv.org/abs/1305.7404 . If this is so, then at least some of the well determined neutrino positions should match known AGN positions. I still don’t understand why Nielson et al didn’t do that simple comparison (maybe they were saving it for Nature). Interesting, do you have any references that discuss how big that effect might be? I would naively assume it would be negligible and would be interested to see otherwise. This was first pointed out for neutrinos from SN 1987A. Of course the net difference from speed of light is very negligible. don’t travel at the speed of light in the real universe. You are correct; the papers are indeed beautiful and were a joy to read. I shall add this miscellany to my cherished knowledge of phenomena. Is there new news from Icecube at the ICRC2013 conference in Buenos Aires? I had worked as an undergrad. in NESTOR (prototype for Km3NeT programme) and am deeply fascinated by neutrino astronomy. Now, I don’t believe that one can strictly speak of the direction of Bert and Ernie, because what was measured was cascades, and the angular resolution for cascades is really poor. The data point to a diffuse flux scenario -no point source evidence so far- and there is small chance that they come from prompt charm decays yet none speaks openly about it. Only more statistics will show. In this write up we have a proton colliding with a photon, putting it into an excited state and then decaying to a neutrino and pion. How is such decay possible? Protons don’t decay ( except rarely if certain GUT models are correct) and they certainly don’t decay into a pion and neutrino which violates B-L charge. What gives? The issue is a fundamental one. Let’s start with a case that you are probably familiar with. Hydrogen atoms are stable and don’t decay. However, an excited hydrogen atom will decay, emitting a photon and becoming a less excited (and possibly unexcited) hydrogen atom. This probably doesn’t bother you. The idea for the proton is the same. A proton in its ground state is stable. An excited proton is not. The only question is: how will the excited proton decay? The simplest excited proton is called the “Delta resonance”. This decays in 10^(-23) seconds or so. What does it decay to? The most rapid way that it can decay is via the strong nuclear force, which means quarks and gluons are involved. The decay can be either to an unexcited proton plus a neutral pion or to an unexcited neutron plus a charged pion. But in that case, the Delta (i.e. the excited proton) could decay in other ways. For example, it could decay to an unexcited proton plus a photon — quite similarly to a hydrogen atom. These same principles govern atomic nuclei as well. Stable nuclei can be put, by a sufficiently hard collision, into an excited state, following which they will decay. Whether they decay rapidly or slowly, and what they decay to, depends very greatly on details; but they will always decay eventually. (mainly through the process proton + photon –> “Delta” [an excited version of the proton] –> neutron + pion, followed by pion –> anti-muon + neutrino, and also by anti-muon –> anti-electron + neutrino + anti-neutrino). Are those lines of right parentheses just serving as paragraph markers, or are they actual code of some kind? If they are meant as paragraph markers, I beg to suggest using something non-polar like —- or ==== rather than the highly polar element )))) ! That is confusing! The display stretches from edge-to-edge of the frame.